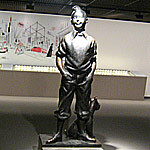 In 1929 belgian comic artist Hergé sent reporter Tintin and his faithful dog Snowy the first time on the road. 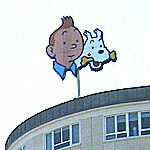 After 23 adventures until 1975 Tintin has a worldwide fan base. 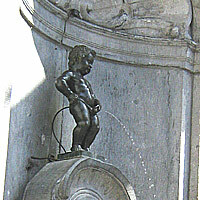 Brussels, the secret comic capital, celebrates its heroes and many other cartoon characters. 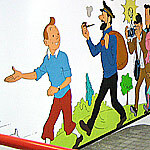 This site gives Tintin fans an overview for visiting the city and towns in the surroundings, eg, the Hergé Museum is located in Louvain-la-Neuve. 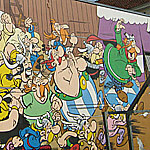 In the heart of the city you will find Tintin anywhere, in the comic strip museum, as mural and of course in shops as the "Boutique TINTIN"
Only a few meters from the centre you can find Tintin climbing on a steam locomotive, Tintin and Snowy in the sky and the annual Tintin flea market. 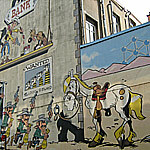 In this part of the city you follow the footsteps of Hergé, the creator of the series. 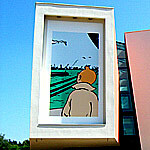 From his birthplace to the Foundation (Fondation Hergé) and the street named after him. 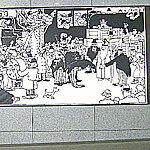 This metro station is a great attraction for fans - figures of all the adventures decorate the walls since the opening 1988. Fiction meets reality - close to his former residence, Hergé found a house as model for a villa in "The Seven Crystal Balls". 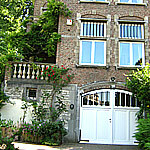 His last years Hergé lived in Uccle. Here he is buried, and also here he revealed a statue of his famous "son". 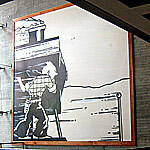 There Hergé had an estate and the nearby Walibi theme park had for some years many attractions inspired by the adventures of Tintin . 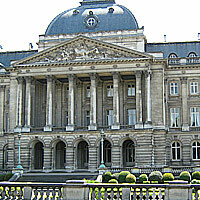 A plaque was attached in May 2009 at the front of the Palais de Congres. 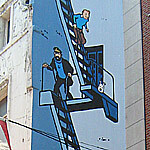 It shows the scene from "The Crab with the Golden Claws", in which Tintin climbs through the porthole behind Captain Haddock. 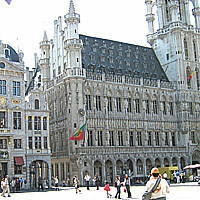 If you run into Kuifje and Bobbie then you've met the flemish Tintin and Snowy, because Belgium speaks more than one language. A 3-day trip can be enough - just don't overbook your day. At the port of city the association "The Seven Suns" erected large-format signs where the action takes place in "The Seven Crystal Balls"